Good News, Conveyancing is Booming! In late 2007conveyancing staff in the North East started to lose their jobs. In a six month period in Sunderland and Newcastle over four hundred people were made redundant and yet not a word was said by the press. Having lived through two previous recessions which affected the legal sector, I knew that we were in big trouble. I also suspected that this would last about five years as had happened in the past. A year ago, Emmersons Solicitors Conveyancing Department started to become really busy. We have doubled the number of staff since then to cope with demand. In the last three months Commercial Property has also seen a major revival. This is excellent news as far as I am concerned. Whilst Conveyancing suffers long before “recession” is ever mentioned, its improvement is seen before the word “recovery” is uttered. With this in mind I would suggest that now is a good time to buy your new home or business premises. I suspect, as has happened in the past, that prices will start to rise soon. There are also some very good mortgage products available now. Eighteen months ago many of our clients could not access a mortgage. 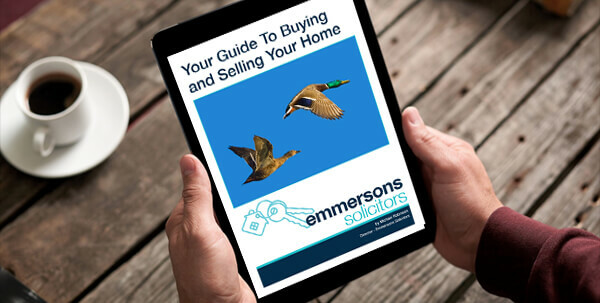 As I mentioned in my last article, our job at Emmersons Conveyancing Solicitors is to protect you and your lender when you are purchasing a property. What may look like the ideal home or business could in fact be fraught with unseen dangers. Problems with the legal title of a property tend to show up years later, they can be hugely expensive, if not impossible to rectify. It is for this reason that we sometimes have to advise a client that the title is such a mess that it is not worth their while attempting to buy the property. We have to send a report to the lender if we uncover any problems, the lender may refuse to release monies needed for the purchase. A gentleman in Northumberland had purchased a house some years ago. He had to drive up his neighbour’s lane to access his own home. This worked very well until the neighbour sold his house and the new owner stopped all access. When we heard about this tale the only way the chap in question could access his home was by helicopter! In another case recently, our Conveyancing Solicitor noticed that the lease over a property gave the leaseholder lots of rights but the person who was living in the house none. It transpired that this affected every house in the street and no one had noticed the defect in title previously. The lease is now being amended at the seller’s expense so that our client will be fully protected in the future. At Emmersons Conveyancing Solicitors we send all of our clients a plan to consider before they purchase. We ask them to compare the plan with the actual land they think they are buying. After all, solicitors do not visit the premises; that is not part of their remit. A common occurrence is where Bert has sold part of his garden to Fred next door. However, in order to save costs neither of them consulted a solicitor at the time. When you decide to buy from Fred you think you are buying the whole of the lovely landscaped garden. This will not be the case legally as the title deeds will still show Bert as part owner. Fine if Bert agrees to help your solicitor rectify the problem but a potential problem if Bert refuses or has since sold his house. Whilst all of the legal technicalities may seem a time consuming hassle at the time, a properly researched and corrected title has the potential to save you thousands of pounds. Money that could better be spent going to Sunderland away games!